Try a new twist on your tacos by balancing sweet and spicy with our new favorite Sweet Sriracha Chicken Tacos! Season chicken with kosher salt. In a medium bowl mix together sriracha, honey, and lime juice. Add chicken to a large plastic bag and add sriracha honey mixture. Put in fridge and let marinate for at least 30 minutes and up to 24 hrs (the longer the better!). When you're ready to eat, heat grill or grill pan. High for the grill and medium for a grill pan. Turn grill down to medium and grill chicken until done, approximately 6-7 minutes on each side, until the center reaches 165 degrees. Note that the marinade will make the skin brown quickly. Meanwhile, add avocado, sour cream, lime juice, cilantro, and salt to a food processor and cream. Shred chicken and add to tortillas. 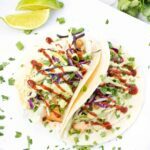 Top with shredded cabbage and drizzles of the avocado cream, sriracha, and fresh cilantro and enjoy!